If you like little Indian Princess Sprinkle and you have never been over to The Cat's Pajamas then you need to go look around! This is just part of one of the newest sets from TCP. How? hehe, just cracks me up. 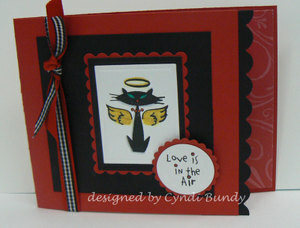 Anywho, this card is for a sketch challenge Julee has over at her store Verve Visual for her next guest designer. Its definately a fun sketch, but Julee's are always beyond the ordinary! 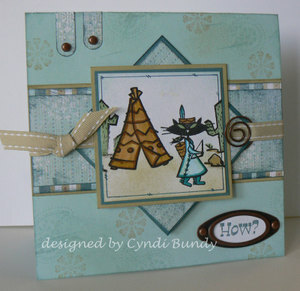 I used TCP Havin' A Pow Wow set along with Stampin' Up's new Western Sky DSP...a pretty good combo! I picked up the colors in the paper with my cardstock: Soft Sky and River Rock. Also used: SU! Word window punch, small oval punch, hodgepodge hardware, River rock ribbon, stampin' sponge,Wanted set, Sky & River Rock pads, and copic markers. Here are a trio of cards that I made last week playing around with my new Clearly Swanky sets from the Cat's Pajamas. These images are all so cute and many had been on my wish list as wood mounted stamps, but when Alma combined them into clear sets, the price couldn't be beat!! The images for these cards all come from either "Puppy Love" or "Loving Mew". The first card uses the frogs from both sets. Aren't they adorable? I just have to snicker. 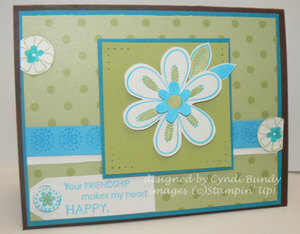 I stamped them on Papertrey Stampers select cardstock...my favorite for use with my copic markers. They are sitting on a small oval stamp from A Muse. The heart is the classic Nestabilities...there was apparently a production problem with the scallops, so I don't have them yet, sigh. The rest of the cardstock is all Stampin' Up! : Real Red, Green Galore, and Basic Black, but I used a piece of pattern paper from Bo Bunny. Ribbon is SU! black gingham. This next card is Sprinkle as a sweet angel. My cat is sweet when she's in the mood, how about yours? But mainly she's a curious stinker. Speaking of, I have some cute Roxie photos that I need to share soon. Anywho, Sprinkle is stamped with Palette Hybrid Noir ink on Papertrey cs that was run through my Cuttlebug machine with my rectangle Nestabilities. I colored her in with copics and a tough of Spica glitter pens. Her wings and of course her bling are all sparkly!! I also used my Nestabilities for the small circle used for the sentiment. The cardstock and pattern paper is all SU! Real Red and Basic Black...and the paper is from the new hostess paper pad. I also used wide Red grosgrain ribbon and Black gingham. The last project turned out really cute...its a rocket pocket! 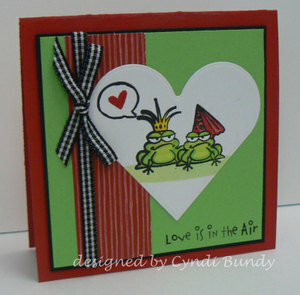 The idea was designed by my fellow ATS DT member Julie B at Paper Pleasing Ideas. Its a simple 1/4 sheet odf cardstock! 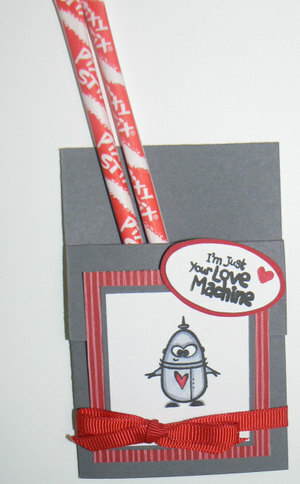 Using her idea, I stamped the cute little robot and "Love Machine" on Papertrey white, still using my copics for coloring. The small red heart is actually from CC Designs Love Ya Much. I used Basic Gray cs for the main pocket, the layers are Real Red and Bo Bunny DP. Its held together with a bit of sticky strip and some ribbon. This page turned out so cute that I decided to show you the whole thing ;) It will be one of the ones in the Beach/Pool track for the upcoming March Scrapbook Day. Thanks Audra for reminding me how much I love these stamps! 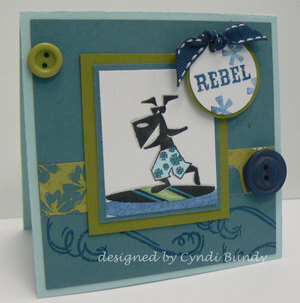 The cute little surfer dudes are from The Cat's Pajamas...Alma designs the MOST adorable stamps!! I used Poochie Frankie, Moon Doogie, and Sprinkle Annette...even the names are cute! I colored these in with my Stampin' Write markers and cut out the images. The palm trees are from an Autumn Leaves set that I borrowed from Haether. The larger font is Pupcat from Lizzie Anne Designs (retired) and the smaller is SU! Simple Type alpha (retired). I got some mojo flowing today! Don't you love how sometimes an idea just pops in your head then actually comes right together? When I got this new Spring Break DSP from Stampin' Up! my first thought was "Poochie Frankie"!! Look at his cute little shorts and his happening board. He's so cool. Poochie is from The Cat's Pajamas. 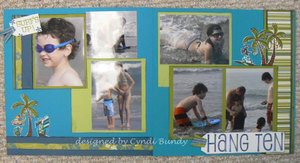 Surf on over to the site and check out all the cool new stamps Alma has offered in Swanky acrylic! I started with Julee's mojo21 sketch, you can see it on her blog Poetic Artistry. I stamped him in Palette Hybrid Noir on Papertrey Stampers Select white cs, then colored him in with my copic markers, picking up the colors from the paper. The card base is Soft Sky, the next mat Blue Bayou, and the small mat is Old Olive. The swirls at the bottom of the card are from a CTMH set called "legendary Moments", which is also where the "rebel" sentiment is from. I couldn't find anything small that said dude, or hang 10, etc. I may need to rectify that! The little star on the tag is from SU! Little Pieces. The ribbon is fancy Pants, and the buttons from my stash. I'm loving how this cute little card turned out! But next, my first attempt at Julee's sketch. My mojo is not so flowing here. I was working on a page for the Girl track of the fundraiser and wanted to share a peek so I thought I'd just adapt it into a card. Well, heres the peek at the sets and colors, but it doesn't seem to work as well on the card...theres a lack of focus. Maybe I just used the wrong sketch for this card. Don't get me wrong, i love Julee's mojo21 sketch this week, but my sample seems to lack the umph it needs? Here are the deets anyway: all supplies are Stampin' Up! cs: Chocolate Chip, Tempting Turquoise, Taken with Teal, Certainly Celery, and Whisper White;stamps Always, Friendship Blooms (I think the name is) ; Ink:tempting Turquoise and Certainly Celery pads, markers Celery and Taken with Teal;other: tool kit, 3/4" circle punch.